In this girl game our evil and bustling minions decided to slow down things and try to do some good and learn in quiet and peace while they are at the library. 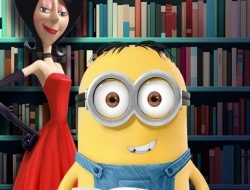 The bad news is that Dave doesn't like the way minions want to spend the day so in one of these minion games you are going to help him to cause a little chaos in the lecture hall. Having fun is the first thing on the list but to do that you must do some hilarious pranks on your friends and you have to be very careful when you do it because once you are spotted the game is over and so is the fun. Try to accomplish all tasks on the list even if you think that is pretty hard to throw bunch of papers on minions when they are distracted, or even harder to vandalize one picture of Scarlet Overkill. Don't rush to much and try to have fun as much as possible. Pay attention when you need to use arrow keys or mouse. Minion lecture hall 0.00 between 0 and 10 based on 0 votes.